We drove for what seemed like an eternity along this winding road past mud brick houses, military regiment unit insignias on rocky hills, hillside forts and dusty Pakistani military outposts. 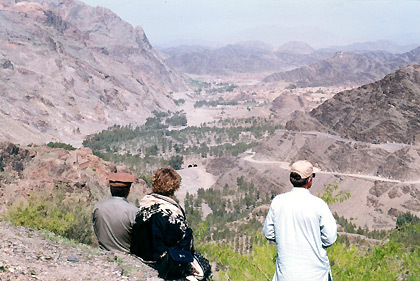 At many a hairpin turn, Khyber levies with their trusty AK-47 assault rifles stood watch. Positioned there to provide security for travelers on the pass, they evoked a completely opposite feeling in me. Finally we were there – at the highest point of the Khyber Pass on the edge of Pakistan’s Northwest Frontier Province overlooking the descent to Afghanistan and the first village into that country. It was the year 2000 when the Taliban still controlled most of Afghanistan and almost a year before 9-11. With a group of representatives of NGOs from various countries we visited several Afghan refugee camps inside Pakistan’s NWFP (Northwest Frontier Province, now the Khyber Pakhtunkhwa province) and even got to observe some people from the Taliban (the Taliban originated in refugee camps inside Pakistan during the Soviet occupation of Afghanistan). Before wrapping up our visit we would venture into the mountain pass starting at its summit 5 kilometers inside Pakistan at the town of Landi Kotal. Our trip ended almost at the border with Afghanistan, on that bare, rocky summit that offered a panoramic view of the pass threading its way into the first village inside that country. 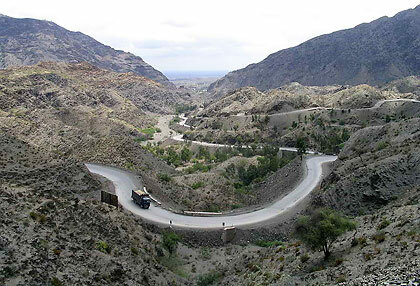 I would learn later that the Khyber Pass used to be an essential part of the ancient Silk Road and therefore an important trade route between Central and South Asia. Its military value is just as great. The pass is the best route for armies invading South Asia from Central Asia and vice versa ensuring its place as one of the most fought-over pieces of real estate in history. 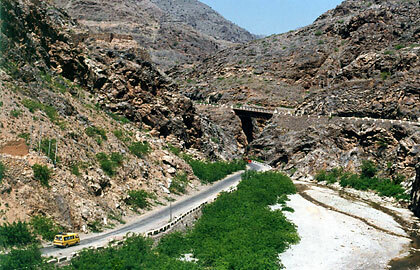 The narrowest section of the Khyber Pass at Ali Masjid fort. The native Pashtuns of this region are no strangers to conflict, having fiercely resisted foreign armies for hundreds of years – and still continue to do so today. We met several of them cradling Kalashnikovs like it was part of their everyday routine, and indeed it was. They are however known to be among the most hospitable people on the planet – a seemingly ironic characteristic. Pashtuns have no second thoughts about slaughtering their last remaining lamb to treat a visitor to a meal. And here at the Khyber Pass they were quite friendly to us. A New Zealander in our group even borrowed an AK-47 from one of them to pose for a picture. As one would expect, the Khyber Pass is a heavily militarized zone with several Pakistani Army forts and observation posts located throughout its length. Memories of past conflicts abound with ruined Buddhist stupas, remnants of the old British railway and insignias of various British Indian army regiments adorning the hillsides. During the time we were there, the Pakistani Army pretty much left the natives to their own since the province was an autonomous region, with tribal chiefs in control. This has changed in recent years with the war in Afghanistan, as the Pakistani Army sought to establish control in parts of the region where militants were known to wield considerable influence. NATO has also been using the pass to transport supplies to its units inside Afghanistan and American drones are active in the province with attacks on suspected militant hideouts. I am not sure if our group would have been able to make the same trip today just as easily as we've had back in 2000. 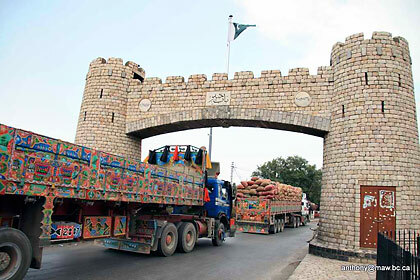 Khyber Gate on Jamrud Road in Yaghistan looking eastbound towards Peshawar. Back at Landi Kotal I was watching the last of a convoy of colorful, decorated trucks head in the opposite direction towards Afghanistan. As the convoy slowly disappeared from view I thought about the more than 2000 years of history and violent conflict that the Khyber Pass represented and wondered if the people here would ever enjoy even a brief period of peace. As I looked around me it seemed that the barren, rocky ground that dominated the geography of this place mirrored the harsh way of life that the people living in these parts had come to accept. Would it remain that way for the next hundred years? After our Khyber Pass adventure we returned to our hotel in the provincial capital of Peshawar. I had the good fortune of making a few visits to this city during more peaceful times and was drawn in a strange way to it. Nowadays you will get a warning advising you to check with your government regarding a travel advisory for Peshawar and other places in the Khyber Pakhtunkhwa, as these places have become unstable due to fighting between the Pakistani army and Islamic militants. 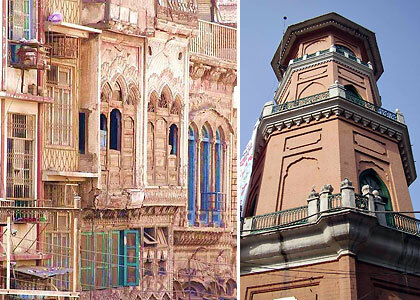 Left: elaborately decorated homes in Peshawar’s old quarter; right: the Clock Tower of Peshawar. Photos courtesy of Wikipedia Commons. Like the Khyber Pass, Peshawar has a colorful past. It is one of the oldest cities in the world, being founded more than 2,000 years ago, and its location has turned it into an important trade center since ancient times. The city of bazaars and forts endured successive invasions from Persians, Greeks, Bactrians, Turks, Mughals, Afghans, Marathas, Sikhs and the British throughout its history. My imagination would ran wild as I ventured into the city’s several historic bazaars such as the famous Qissa Khawani Bazaar and I would envision ancient invaders marching up the very street I was walking on. Even the recent history of the Qissa Khawani Bazaar is not spared from violence; in 1930 British troops gunned down 400 demonstrators here. And in the 1980s Peshawar witnessed rampant street violence as a proxy war broke out between Soviet agents and US CIA-backed mujahedeen. These days the city is affected by the ongoing struggle between Taliban extremists and moderates. 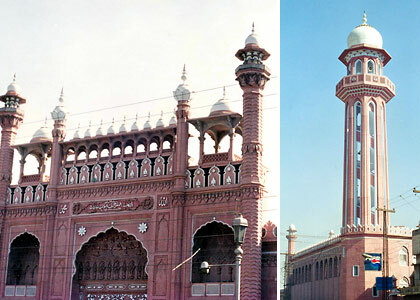 Left: Façade of the Sunehri Mosque; right: a minaret in Peshawar. Despite rapid growth and development many examples of old architecture remain. Brick and wooden houses with elaborately carved designs on doors and balconies may be seen everywhere. Peshawar used to be a walled city with a citadel and 16 gates. The walls are practically gone but some of the gates have managed to survive. Historic landmarks include the Bala Hisar Fort, the aforementioned Qissa Khawani Bazaar, various mosques displaying intricate décor and the Clock Tower. 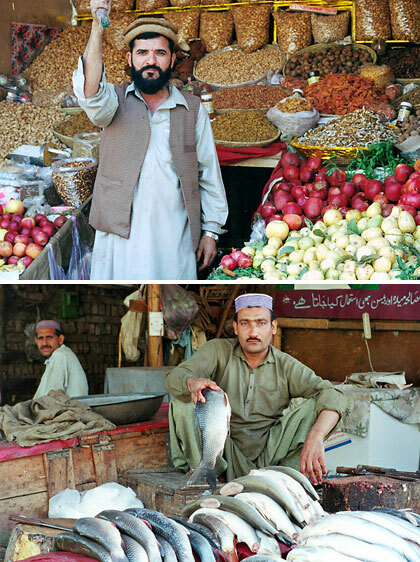 But probably the one feature of Peshawar that continues to conjure images of that city to me is the wheeling and dealing nature of the majority Pashtun population as evidenced by the numerous bazaars in the city. These sell a variety of souvenir items such as traditional carpets, pottery and artwork in wood, brass and semi precious stones. I ended up buying a Chitral woolen cap that I gave as a gift to a friend in the Philippines who had Punjabi features. I also encountered a trader who invited me over for tea at his place and offered some pretty interesting items for sale – namely Soviet military items such as insignias, uniforms, binoculars and trench periscopes. I did not bother to ask where he got them and could barely control myself from asking if he had any guns or rocket-propelled grenade (RPG) launchers in tow. My Pakistani friends later told me that his gesture of inviting me upstairs to his place meant he considered me a special person and that he probably could have sold me weapons had I asked him. I also found out that there is a thriving gun-making industry in the tribal areas; the Pashtuns had been copying guns for centuries. The Russian AK-47, a robust and simple, yet very effective assault rifle, is an easy copy for these guys. Peshawar is known for its dried fruits and nuts. And the food! As a fan of South Asian food (and many more besides), I have come to enjoy Pashtun food. It has similarities to Persian and Indian (specifically Punjabi) cuisine so it wasn’t hard for me to enjoy anything set in front of me. My most unforgettable dining experience was sitting down on the ground with some town elders for a meal in Mardan, a city just north of Peshawar. The curried lamb was excellent although I would have preferred sweet to salty lassi that these locals usually drink. I also thought that their version of naan was a bit too thick for me but I thoroughly enjoyed their biryani – actually an Afghan lamb biryani that included nuts and raisins. Normally I do not like raisins on dishes but the Afghan biryani was the exception. Its slightly salty taste really complemented the other ingredients of the biryani and resulted in a simple but excellent dish. if only the situation there would be more stable. Photo courtesy of Wikipedia Commons. I still dream of going back to Peshawar and the Khyber Pass. 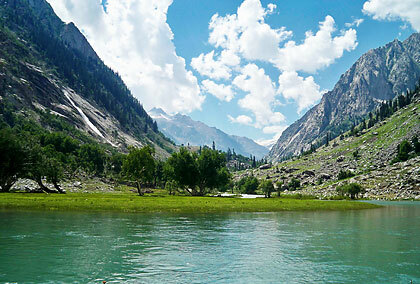 And then there’s the Swat Valley and the alpine regions north of Peshawar in the Hindu Kush which I believe is a tourist paradise waiting to be discovered. Alas the problem continues to be the peace and order situation with the presence of militants in the area. We can only pray the situation improves not just for us but for the future of the local populace.